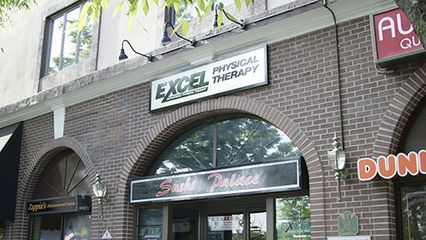 Located in the heart of downtown Summit and directly across the street from the Summit Train station, our twelfth office brings the EXCEL experience to Union County. The 4,300 square foot space is openly divided into functional exercise and treatment areas. Brianne graduated with honors from Columbia University with a Doctorate in Physical Therapy. Prior to her graduate studies, Brianne graduated with a Health and Exercise Science degree from The College of New Jersey. While at The College of New Jersey, Brianne was president of her Collegiate Club Volleyball team and a member of the Great American Volleyball beach league. In high school, Brianne was an all-state volleyball and basketball player. She was inducted into the athletic hall of fame at Saddle River Day School in 2013. Brianne enjoys treating patients across all age ranges and injuries. However, she has taken particular interest in treating foot/ankle injuries and low back/SI dysfunctions. As an avid runner, she is able to analyze and address running dysfunctions and as an athlete, she is able to draw from a wide array of experiences to make treatment programs fun and engaging.